I’ll admit, going into this book, I had no idea who William James was. I didn’t even realize what the author was trying to do by including so much information about William James, or why he was interested in him, and what that had to do with the rest of the subject matter of the book. All I really knew was that this book was available to be reviewed, the title was intriguing, and I wanted to read it. 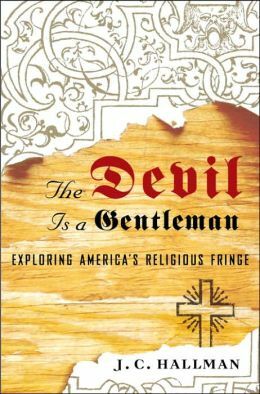 The Devil Is a Gentleman is a book exploring a number of religious fringe groups in the United States (and Canada) while simultaneously exploring William James’ life, as well as his theological and philosophical pursuits. The format is easy enough to understand: an introduction to William James, a chapter on this or that fringe group, a interlude of a period of William’s life, lather, rinse, repeat. Being neither familiar with William James, nor with the author, J.C. Hallman, I wasn’t entirely sure going into this book what to expect. Being someone who has some familiarity with some of what could fall under “fringe” groups, I’ll admit to being somewhat hesitant to even dive into the book. How much snide remarks and barbed comments would I have to slog through? I knew that at some point the author would be treating pagans to his exploration, and I was braced for the worse. Except, he wasn’t. J.C. Hallman’s treatment of the beliefs of the people he interviewed and interacted with was balanced, open, and respectful. This was my introduction to William James’ influence upon the author – admittedly he was just getting into studying James’ work, but there was an open questioning, a wanting to understand, and an underlying appreciation that carried through the whole book. Alternative belief systems may look strong on the outside, and every time we get used to the strangeness of one, another comes along to take the “most strange” place, but how much does that matter? If a belief system provides hope, provides a context that the members can relate to and helps them become better people in this world, what does it matter, the story they tell themselves about the world and how it is the way it is? The author takes us all over the ‘weird’ map: from Unariuns to Satanists, from ‘Godless’ to ‘Goddess’, from Scientology to Ar nDraiocht Fein, from wrestlers spreading their god’s message via the ring to the Monks of New Skete and their dog breeding and training. Through it all he weaves in the story of William James’ struggle to find an explanation and a cure for the unrest that plagued him throughout his life, and he does it all while sharing his own explorations through his theological landscape. He questions and challenges. He isn’t always completely upfront with everyone he interviews, but that doesn’t seem to keep him from being able to maintain a certain level of respect that I think everyone could benefit from. We don’t have to agree in order to treat one another with respect, and this need for all of our stories to make sense to one another does not serve us well, in the end. I found this book to be be fascinating, and it allowed me to explore things I might not have been exposed to, otherwise. This is certainly worth checking out.